Nagkaisa! is satisfied over the passage on third reading of HB 6908 on the Security of Tenure at the House of Representatives. Nagkaisa! said that "the SOT bill is a great improvement to existing legislation as it gives more teeth to the government by providing penalties for those who will violate the security of tenure laws." "This is the farthest a proposed law on SOT has gone for decades," said Nagkaisa! "Now, it's time to get the Senate moving on their proposed SOT measure." "HB 6908 gives more flesh and blood to the guaranteed right to security of tenure," Nagkaisa! said. "It's not perfect or ideal, but we can live with it," said Nagkaisa!, the largest labor coalition in the country. Nagkaisa! also addressed fears of employers who went on record saying that they will have a "big problem" if the proposed measure was passed. "If the big problem employers have about HB 6908 refers to the potential cutbacks in the windfall of profits a number of employers have been amassing through the massive abuse of workers via contractualization for decades, the bill intends to do just that," Nagkaisa! said. "Employers who do not abuse workers through contractualization have nothing to fear," Nagkaisa! added. "Never in the history of employment relationship in the country has workers enjoying regular employment and implementation of strict rules in labor contracting been detrimental to the economy and job generation," Nagakaisa! said. "Job generation is a function of the development of sectors of the economy influenced by economic policies of the government, and not by labor contracting practices," Nagkaisa explained. A "serious problem" employers noted is that if the SOT bill becomes a law, it will be detrimental to the economy and job creation. Nagksaisa! countered the argument. "Workers with regular employment generate more income, thus, with more purchasing power contribute to increasing demand in goods and services that lead to higher income taxes and VAT for the government. These are all good for the economy," said Nagkaisa. "The fear that the HB can lead to unemployment is only possible if they are not paying their contractual employees what the law currently demands. 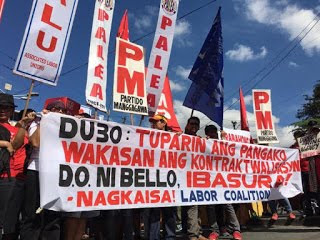 In other words, their argument is an admission that they are doing business at the expense of workers’ rights - and they want to continue doing so," Nagkaisa! added. The recent statement by the employers didn't specify which provisions of the bill they strongly disagree with. Nagkaisa! said it was grateful to Labor Committee Chair Rep. Ting who steered the discussions and Rep. Raymond Mendoza of TUCP Partylist and Rep. Tom Villarin of Akbayan Partylist who co-authored the SOT Bill and helped defend it together with Nagkaisa.